The good news is there are some ways that you can make the experience better and moreover you can create beautiful images. As stated earlier, it is not easy. So why do it? There are a few simple reasons why it is worth having underwater shots in your portfolio. It shows that you as a model are not afraid of doing what it takes to get great images. Most serious photographers recognize the challenges of shooting underwater. Buoyancy. Let's face it, everything floats and has lift underwater. Gravity goes away. Getting that ethereal look of a floating angel cannot be achieved any other way in camera. Underwater shots provide an entirely new genre and look. Underwater light is very different and can be amazingly beautiful. It is unique and can make for epic images that can't be done anywhere else. It sets you apart as a model. 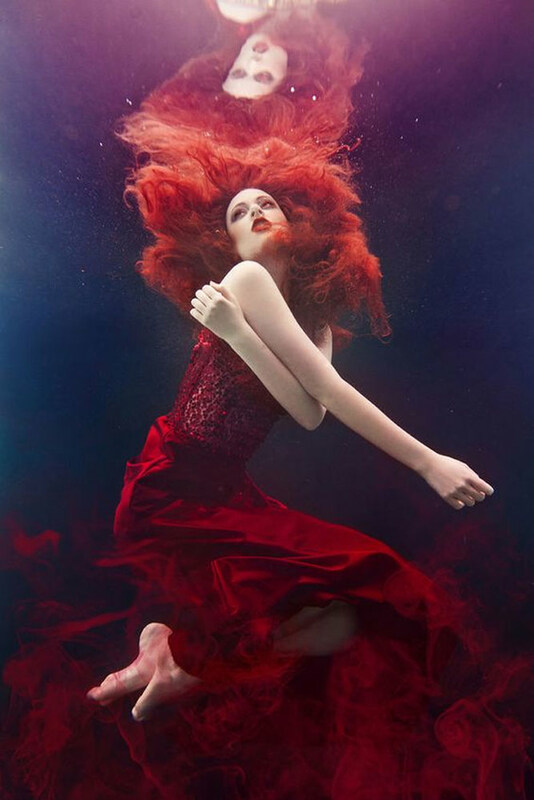 Only a small percentage of models have underwater work in their portfolio. Those that have shot underwater often use those shots a features in their portfolio. For your first couple of shoots, there are some simple concepts that will help you avoid common issues. You have to look like you are above water. Sounds basic and simple but it is not. Humans are conditioned to hold their breath under water. As kids we purse our cheeks because we think that that will give us the most air underwater. In fact, most of the air we consume is in our lungs and therefore looking like a chipmunk underwater doesn't help that much. When you are underwater, the key is to hold air in your lungs, not your cheeks. Don't blow bubbles. As children, we're taught to blow bubbles when we go underwater. Later as scuba divers, we teach never to hold your breath. As an underwater model, ignore all of that. Bubbles distract from your pose unless they are a planned part of the composition. This takes practice. Part of the reason you want to blow bubbles particularly out of your nose is to push water from flooding your sinuses. One of the skills that a good underwater model masters is pushing a small amount of air into their nose. You want just enough to block water and pressure from flowing in but not enough to generate bubbles in the capture. Keep your eyes open. This sounds obvious, but again, it is harder than it sounds. As kids in a heavily chlorinated pool or in the ocean, it hurts to open your eyes underwater for any period of time. The natural tendency is to close your eyes or squint when under water. Going back to number 1 above, you want to look like you are above water and therefore you eyes need to be open and relaxed. One key to this is the water you are in. My pool is a salt water pool that is Ph balanced to avoid eye and skin irritation. Even then, human eyes don't like being underwater. I coach models to close their eyes if there is latency between the image capture and their pose setup. Decide on you pose before you go down. Most humans can comfortably hold their breath for around 1 minute. In that time you are going to defend the the shoot depth, get in to your pose, make sure your hair and wardrobe are set, and give the photographer time to get 3-4 images. Ideally, you have enough time to get direction from the photographer or styling director before they shoot. It all happens fast. If you can practice holding your breath underwater in an outfit and posing. It will make you much more comfortable during the shoot. "FLOWEY" is not a real word yet, but when you are working on wardrobe, this is what you want. One of the first cinematographic images that exploited underwater filming was 300. The magic comes from the lack of gravity and the ethereal movement of your clothes and fabrics while down under. This is not an absolute. You can have great images with tight, form fitting clothing, but keep in mind then you want to emphasize some other aspect of underwater like floating or the soft curves you get when gravity doesn't pull you down. It can be hard to stay down. The human body has a tendency to float, particularly when we take a deep breath. One of the challenges underwater models face is maintaining their pose while having a tendency to float up. This can offset in a few ways. First, you can carry or attach weights to offset your natural buoyancy. We have a variety of scuba weights including ankle weights that work well. They can be challenging to hide and require post processing to remove as well Alternatively you can control the amount of air in your lungs to an extent. Know your limits. There are free divers that can dive to hundreds of feet for 5 minutes or more. They are an exception and unless otherwise identified, no photographer should expect you to go deeper than 10 feet for one minute. If I want something different than that, I will advertise and pay for a free diver who is also a model. More importantly, I will provide one or more safety divers who are never more than 10 feet away from the model. Moreover, I will make sure that model is trained as either a free diver or a scuba diver. If you are not a comfortable swimmer, let your photography team know. You can still model in 5 feet or less where you can stand up whenever you need to. DO NOT GET TALKED INTO MODELING BEYOND YOUR COMFORT LEVEL. The last thing I want is for a model to be scared or stressed during a shoot. Unlike other photography genres, underwater photography is relatively new. As such there isn't a lot of good posing guides or direction like there is for above water. That said, there are some great examples of poses that any model can use when doing an underwater shoot. Let's look at some basic poses that you can use to get great images. Here is some inspiration shots from other great photographers and models.